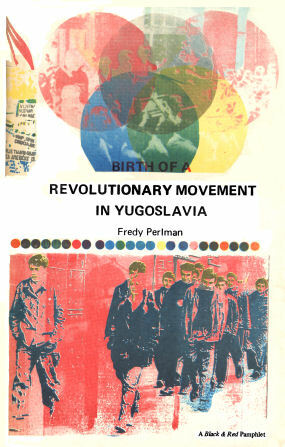 1969 pamphlet by Fredy Perlman on the beginnings of the 1968 revolutionary movement in Yugoslavia. Later republished as "Revolt in socialist Yugoslavia: June, 1968". In Yugoslavia, where "workers' self-management" has become the official ideology, a new struggle for popular control has exposed the gap between the official ideology and the social relations which it claims to describe. The heretics who exposed this gap have been temporarily isolated; their struggle has been momentarily suppressed. The ideology of "self-management" continues to serve as a mask for a commercial-technocratic bureaucracy which has successfully concentrated the wealth and power created by the Yugoslav working population. However, even a single and partial removal of the mask spoils its efficacy: the ruling "elite" of Yugoslavia has been exposed; its "Marxist" proclamations have been unveiled as myths which, once unveiled, no longer serve to justify its rule. In June 1968, the gap between theory and practice, between official proclamations and social relations, was exposed through practice, through social activity: students began to organize themselves in demonstrations and general assemblies, and the regime which proclaims self-management reacted to this rare example of popular self-organization by putting an end to it through police and press repression. The paradox can be stated in more general terms: social relations already known to Marx reappear in a society which has experienced a socialist revolution led by a Marxist party in the name of the working class. Workers receive wages in exchange for their sold labor (even if the wages are called "personal incomes" and "bonuses"); the wages are an equivalent for the material goods necessary for the workers' physical and social survival; the surplus labor, appropriated by state or enterprise bureaucracies and transformed into capital, returns as an alien force which determines the material and social conditions of the workers' existence. According to official histories, Yugoslavia eliminated exploitation in 1945, when the Yugoslav League of Communists won state power. Yet workers whose surplus labor supports a state or commercial bureaucracy, whose unpaid labor turns against them as a force which does not seem to result from their own activity but from some higher power--such workers perform forced labor: they are exploited. According to official histories, Yugoslavia eliminated the bureaucracy as a social group over the working class in 1952, when the system of workers' self-management was introduced. But workers who alienate their living activity in exchange for the means of life do not control themselves; they are controlled by those to whom they alienate their labor and its products, even if these people eliminated themselves in legal documents and proclamations. This profoundly socialist tendency represents a struggle against the dependence and helplessness which allows workers to be exploited with the products of their own labor; it represents a struggle for control of all social activities by those who perform them. Yet what form can this struggle take in a society which already proclaims self-organization and self-control as its social, economic and legal system? What forms of revolutionary struggle can be developed in a context where a communist party already holds state power, and where this communist party has already proclaimed the end of bureaucratic rule and raised self-management to the level of an official ideology? The struggle, clearly, cannot consist of the expropriation of the capitalist class, since this expropriation has already taken place; nor can the struggle consist of the taking of state power by a revolutionary Marxist party, since such a party has already wielded state power for a quarter of a century. It is of course possible to do the thing over again, and to convince oneself that the outcome will be better the second time than the first. But the political imagination is not so poor that it need limit its perspectives to past failures. It is today realized, in Yugoslavia as elsewhere, that the expropriation of the capitalist class and its replacement by "the organization of the working class" (i.e. the Communist Party), that the taking of national-state power by "the organization of the working class" and even the official proclamation of various types of "socialism" by the Communist Party in power, are already historical realities, and that they have not meant the end of commodity production, alienated labor, forced labor, nor the beginning of popular self-organization and self-control. Consequently, forms of organized struggle which have already proved themselves efficient instruments for the acceleration of industrialization and for rationalizing social relations in terms of the model of the Brave New World, cannot be the forms of organization of a struggle for independent and critical initiative and control on the part of the entire working population. The taking of state power by the bureau of a political party is nothing more than what the words say, even if this party calls itself "the organization of the working class," and even if it calls its own rule "the Dictatorship of the Proletariat" or "Workers' Self-Management." Furthermore, Yugoslav experience does not even show that the taking of state power by the "organization of the working class" is a stage on the way toward workers' control of social production, or even that the official proclamation of "workers' self-management" is a stage towards its realization. The Yugoslav experiment would represent such a stage, at least historically, only in case Yugoslav workers were the first in the world to initiate a successful struggle for the de-alienation of power at all levels of social life. However, Yugoslav workers have not initiated such a struggle. As in capitalist societies, students have initiated such a struggle, and Yugoslav students were not among the first. The conquest of state power by a political party which uses a Marxist vocabulary in order to manipulate the working class must be distinguished from another, very different historical task: the overthrow of commodity relations and the establishment of socialist relations. For over half a century, the former has been presented in the guise of the latter. The rise of a "new left" has put an end to this confusion; the revolutionary movement which is experiencing a revival on a world scale is characterized precisely by its refusal to push a party bureaucracy into state power, and by its opposition to such a bureaucracy where it is already in power. By May,1968, Yugoslav students had a great deal in common with their comrades in capitalist societies. A front page editorial of the Belgrade student newspaper said, "the tension of the present social-political situation is made more acute by the fact that there are no quick and easy solutions to numerous problems. Various forms of tension are visible in the University, and the lack of perspectives, the lack of solutions to numerous problems, is at the root of various forms of behavior. Feeling this, many are asking if the tension might be transformed into conflict, into a serious political crisis, and what form this crisis will take. Some think the crisis cannot be avoided, but can only be blunted, because there is no quick and efficient way to affect conditions which characterize the entire social structure, and which are the direct causes of the entire situation." ("Signs of Political Crisis, Student, May 21, 1968, p. 1.) The same front page of the student paper carried the following quotation from Marx, on "the veiled alienation at the heart of labor": "...Labor produces wonders for the rich, but misery for the worker. It produces palaces, but a hovel for the worker. It produces beauty, but horror for the worker. It replaces labor with machines, but throws part of the workers backward into barbarian work, and transforms the other part into machines. It produces spirit, but for the worker it produces stupidity and cretinism." With these elements--an awareness of the inseparability of university problems from the social relations of a society based on alienated labor, an awareness of the experience of the international "new left," and an awareness of the difference between self-organization by the rank and file and bureaucratic organization--the Belgrade students moved to action. The incident which set off the actions was minor. On the night of June 2, 1968, a performance which was to be held outdoors near the students' dormitories in New Belgrade, was held in a small room indoors; students who had come to see the performance could not get in. A spontaneous demonstration began, which soon included thousands of students; the demonstrators began to walk toward the government buildings. They were stopped, as in capitalist societies, by the police (who are officially called a "militia" in the self-managed language of Yugoslavia); students were beaten by militia batons; many were arrested. In addition to police repression, the dominant interests succeeded in isolating and separating the students from the workers, they temporarily succeeded in their "unscrupulous attempt to separate and create conflict between the progressive student movement and the working class whose full emancipation is also the students' goal." This was done in numerous ways. The ban on the student press and misreporting by the official press kept workers ignorant of the students' goals; enterprise directors and their circles of experts "explained" the student struggle to "their" workers, instructed workers to defend "their" factories from attacks by "violent" students, and then sent letters to the press, in the name of the "workers' collective," congratulating the police for saving Yugoslav self-management from the violent students. "According to what is written and said, it turns out that it was the students who used force on the National Militia, that they blocked militia stations and surrounded them. Everything which has characterized the student movement from the beginning, in the city and in the university buildings, the order and self-control, is described with the old word: violence... This bureaucracy, which wants to create a conflict between workers and students, is inside the League of Communists, in the enterprises and in the state offices, and it is particularly powerful in the press (the press is an outstandingly hierarchic structure which leans on self-management only to protect itself from critiques and from responsibility). Facing the workers' and students' movement, the bureaucracy feels that it's losing the ground from under its feet, that it's losing those dark places where it prefers to move--and in fear cries out its meaningless claims.... Our movement urgently needs to tie itself with the working class. It has to explain its basic principles, and it has to ensure that these principles are realized, that they become richer and more complex, that they don't remain mere slogans. But this is precisely what the bureaucracy fears, and this is why they instruct workers to protect the factories from students, this is why they say that students are destroying the factories. What a monumental idiocy!" (D. Vukovic in Student, June 8, 1968, p. 1) Thus the self-managed directors of Yugoslav socialism protected Yugoslav workers from Yugoslav students just as, a few weeks earlier, the French "workers' organizations" (the General Federation of Labor and the French Communist Party) had protected French workers from socialist revolution. This speech, which in itself represents a self-exposure, left open only two courses of action: either a further development of the movement completely outside of the clearly exposed political organizations, or else co-optation and temporary silence. The Yugoslav movement was co-opted and temporarily silenced. Six months after the explosion, in December, the Belgrade Student Union officially adopted the political action program proclaimed in June. This version of the program included a Part I, on the social goals of the struggle, a Part II, on university reform, and a newly added Part III, on steps to be taken. In Part III it is explained that, "in realizing the program the method of work has to be kept in mind. 1) The Student Union is not able to participate directly in the solution of the general social problems (Part I of the program)... 2) The Student Union is able to participate directly in the struggle to reform the University and the system of higher education as a whole (Part II of the program), and to be the spokesman of progressive trends in the University." (Student, December 17, 1969, p. 3.) Thus several events have taken place since June. The students' struggle has been institutionalized: it has been taken over by the "students' organization." Secondly, two new elements have been appended to the original goals of the June struggle: a program of university reform, and a method for realizing the goals. And, finally, the initial goals of the struggle are abandoned to the social groups against whom the students had revolted. What was once an appendix has now become the only part of the program on which students are to act: "university reform." Thus the revolt against the managerial elite has been cynically turned into its opposite: the university is to be adapted to serve the needs of the dominant system of social relations; students are to be trained to serve the managerial elite more effectively. The content of "university reform" is defined by the Rector of the University of Belgrade. In his formulation, published in Student half a year after the June events, the Rector even includes "goals" which the students had specifically fought against, such as separation from the working class for a price, and the systematic integration of students, not only into the technocracy, but into the armed forces as well: "The struggle to improve the material position of the university and of students is our constant task... One of the key questions of present-day work at the university is the imperative to struggle against all forms of defeatism and demagogy. Our university, and particularly our student youth, are and will be the enthusiastic and sure defense of our socialist homeland. Systematic organization in the building of the defensive power of our country against every aggressor, from whatever side he may try to attack us, must be the constant, quick and efficient work of all of us." (D. Ivanovic in Student, October 15, 1968, p. 4.) These remarks were preceded by long and very abstract statements to the effect that "self-management is the content of university reform." The more specific remarks quoted above make it clear what the Rector understands to be the "content" of "self-management." Under the heading of University reform, one of Yugoslavia's leading (official) economists advocates a bureaucratic utopia with elements of magic. The same economist who, some years ago, had emphasized the arithmetical "balances of national production" developed by Soviet "social engineers" for application on human beings by a state bureaucracy, now advocates "the application of General Systems Theory for the analysis of concrete social systems." This General Systems Theory is the latest scientific discovery of "developed and progressive social systems"-like the United States. Due to this fact, "General Systems Theory has become indispensable for all future experts in fields of social science, and also for all other experts, whatever domain of social development they may participate in." (R. Stojanovic, "On the Need to Study General Systems Theory at Social Science Faculties," Student, February 25, 1969.) If, through university reform, General Systems Theory can be drilled into the heads of all future Yugoslav technocrats, presumably Yugoslavia will magically become a "developed and progressive social system"--namely a commercial, technocratic and military bureaucracy, a wonderland for human engineering. The official ideology of Socialist Yugoslavia does not conflict with the interests of its commercial-technocratic elite; in fact it provides a justification for those interests. In March,1969, the Resolution of the Ninth Congress of the Yugoslav League of Communists referred to critiques by June revolutionaries only to reject them, and to reaffirm the official ideology. The absurd contention according to which commodity production remains the central social relation in "socialism" is restated in this document. "The economic laws of commodity production in socialism act as a powerful support to the development of modern productive forces and rational management." This statement is justified by means of the now-familiar demonology, namely by the argument that the only alternative to commodity production in "socialism" is Stalin: "Administrative-bureaucratic management of administration and social reproduction deforms real relations and forms monopolies, namely bureaucratic subjectivism in the conditions of management, and unavoidably leads to irrationality and parasitism in the distribution of the social product..." Thus the choice is clear: either maintain the status quo, or else return to the system which the same League of Communists had imposed on Yugoslav society before 1948. The same type of demonology is used to demolish the idea that "to each according to his work," the official slogan of Yugoslavia, means what the words say. Such an interpretation "ignores differences in abilities and contributions. Such a demand leads to the formation of an all-powerful administrative, bureaucratic force, above production and above society; a force which institutes artificial and superficial equalization, and whose power leads to need, inequality and privilege..." (Student, March 18, 1969.) The principle "to each according to his work" was historically developed by the capitalist class in its struggle against the landed aristocracy, and in present day Yugoslavia this principle has the same meaning that it had for the bourgeoisie. Thus the enormous personal income (and bonuses) of a successful commercial entrepreneur in a Yugoslav import-export firm is justified with this slogan, since his financial success proves both his superior ability as well as the value of his contribution to society. In other words, distribution takes place in terms of the social evaluation of one's labor, and in a commodity economy labor is evaluated on the market. The result is a system of distribution which can be summarized by the slogan "from each according to his ability, to each according to his market success," a slogan which describes a system of social relations widely known as capitalist commodity production, and not as socialism (which was defined by Marx as the negation of capitalist commodity production). Managers organize a revolution in order to manage, but an authentic revolution is only possible from the bottom, as a mass movement. Society rises as a historical subject and creates the identity of politics which is the basis for the elimination of politics as a form of human alienation.